These are stamped and have theAlbert Colledge signature on the back. Denby Arabesque Dinner Plates 10”. You are looking at 2 x Denby Arabesque 10” Dinner plates in immaculate condition with no marks or scratches. Starting price is £9.50 for 2 Plates. 1 Denby Arabesque coffee pot with lids 8.5" tall. The pot is in good condition but the lid has a blemish in the glaze. see photos. I am downsizing my collections. in good condition. No cracks. It would make a useful addition to your collection. 18cm x 13cm x 20cm at widest point. Denby Imperial Blue Plates Unusual Darker. DENBY SUGAR BOWL FROM THE ODE COLLECTION. THANX FOR LOOKING. 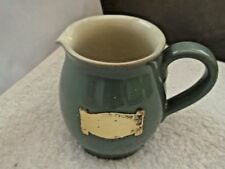 DENBY CREAM/MILK JUG FROM THE ODE COLLECTION. THANX FOR LOOKING. Denby oval serving dish in the potters wheel pattern. Five Denby Homestead Brown Duck Egg Blue Tea Plates 6.5 inches diameter. Used but in good condition. Collection Only. Cash on Collection. No Returns. A Lovely Denby Hand Painted Large Jug. Signed by Glyn Colledge on base. SMALL STORAGE POT FROM DENBY. EXCELLENT CONDITION. Scarce item from the 1930's, top quality for the period. Height 5" with lid on Width 6". Scarce item from the 1930's, top quality for the period. Height 3"Length 8" Width 6"cm. Denby Azure - Blue Storage Jar with wooden lid. DENBY STORAGE JAR WITH LID. ODE COLLECTION. Great practical little pot made by Denby Pottery. Dark brown gloss exterior with a contrasting pale blue interior. Capacity - 1/2 Pint. SET OF 4 ( 8 pieces). DENBY EARTHEN WEAR DINNER SERVING DISH. IN PERFECT CONDITION. Pot 8.75" tall and 7.5" spout to handle. Designed by David Yorath, signed by Audrey Cole Parker with "ACP" on the base along with the Denby stamp. 'Potters Wheel' range and the design is Minaret. 7", 3 pint green Bourne Denby Jug. 'Byngo' was produced in 3 Sizes. BOURNE DENBY ENGLAND. 6 1/2" French Bulldog. CONDITION REPORT . Denby oval dinner/serving plate in the Potters Wheel tan centre pattern as new 2 available. Denby milk jug in the Potters Wheel pattern as new. 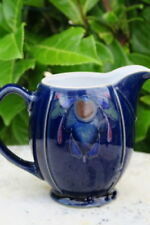 As new Denby tea pot in the potters wheel pattern grab a bargain one only. A lovely denby `shiraz` teapot which is in ex condition. DENBY COTTAGE BLUE 1 PT COFFEE / HOT WATER POT. VGC. Stands 5.1/2" high excluding lid. Denby Mustard pot with lid in the Potters Wheel pattern. Taken from the Denby website: Denby is very much a handcrafted product, where glazes are often applied by hand. Denby milk jug in the Potters Wheel pattern like new. 10% of the sale price supports Love in Action (International) to educate children & young people in Masaka, Uganda. Cup & Saucer - 5 Available. Gorgeous Denby Baroque divided serving dish. It would make a useful addition to your collection. Denby Bourne Two Tone Blue Jug Lidded. Very lovely with the white ceramic button for opening the jug. Lovely blues and rustic in its appearance. Not massive at 12cm tall. No chips,crack or crazing. These are the tankard-style waisted mugs and have the Denby backstamp. 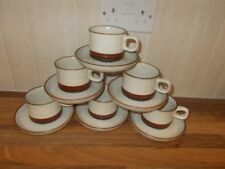 These Denby mugs are in good condition for their age.